Alsace wine route. Grape harvesting and wine tasting in Riquewihr. 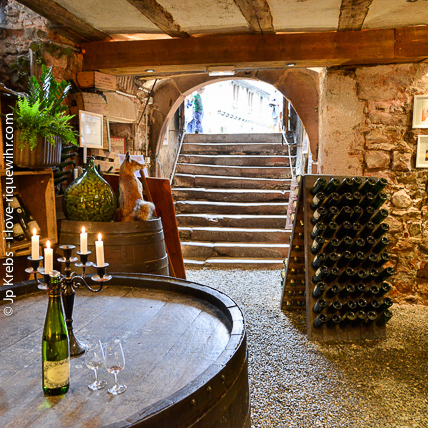 Winemaker and cellar addresses in Riquewihr. More about Alsace wines: riesling muscat pinot gris pinot noir and gewurztraminer. View from the height of the Schoenenbourg famous vineyards... Riquewihr in the background, the Vosges and more vines! 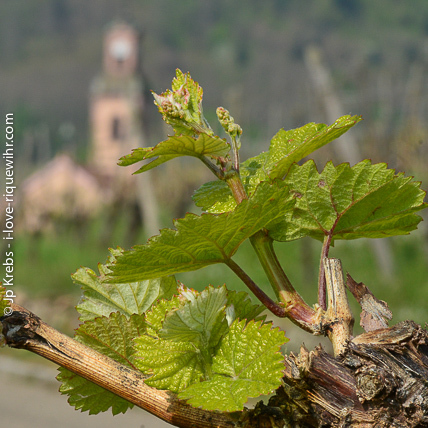 Visitors can easily explore the heart of the vineyards of Riquewihr and the nearby villages like Hunawihr, Zellenberg, Beblenheim or Kientzheim. You will walk along numerous vineyard paths, or wine trails, leading to the crest of each slope, where signs explain the work of the winegrowers and the diversity of the grape varieties grown. There are no fewer than 46 of these wine trails in Alsace, winding their way through the heart of the vines and the picturesque towns. 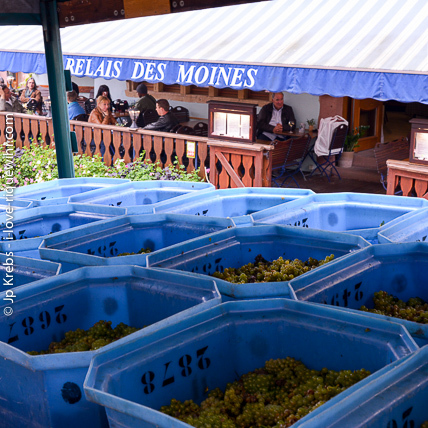 For a two-hour walk, at most, each wine trail offers a view of the colours and flavors of Alsace, and a connection with the personalities of the growers that bring them to life. 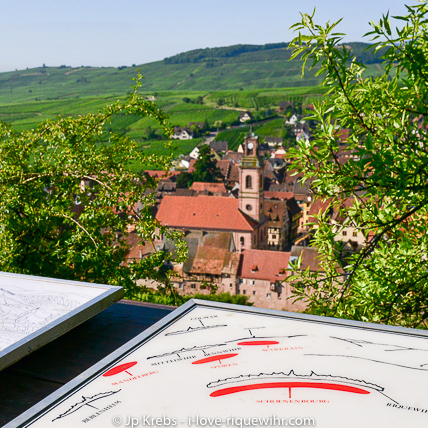 The tourist office in Riquewihr carries the detailed maps of the wine trails / paths around Riquewihr. 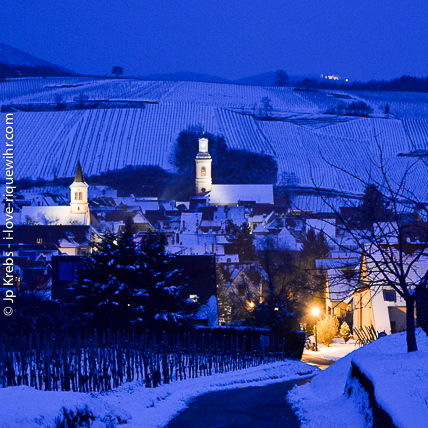 Discover our holiday vacation rentals in Alsace in one glimpse. From the studio to the large luxury apartment: our 15 romantic gites in Alsace (14 in the historical city of Riquewihr) provide some of the best self catering accommodation in Alsace. Select yours! Display all apartment availabilities on one page. Instant booking available. Best price guaranty. Book direct with no booking fees: we are the owners! Bedroom in our Little Wolf**** apartment. One of our 6 outstanding vacation rental apartments newly rebuilt in a former historical winery facing the most famous vineyard in Riquewihr. 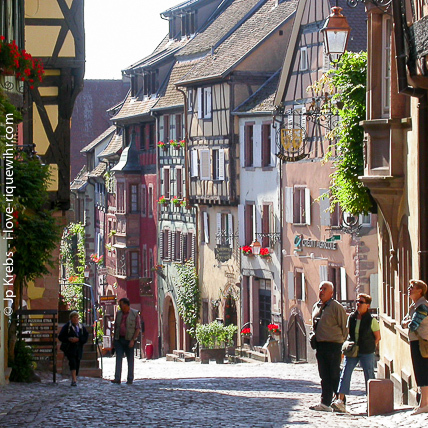 Some years ago the Lonely Planet’s Best in Travel had picked Alsace as one of the hot regions in the world to visit. Again beginning of 2018, the region of Colmar was voted #3 Top Destination in Europe. Alsace is one of the most beautiful and distinctive regions of France and is famous for its wine, gastronomy and wine tourism facilities. Alsace has been a pioneer in wine tourism in France with the development of the Wine Route which has, over the past 60 years, contributed to the success of Alsace wines. Famous for its exceptional natural beauty, the Wine Route leads visitors across rows of undulating, vine-covered hills, and through delightful quaint villages with narrow streets and charming flower-decked houses. Each 'terroir' (the type of soil the vines are growing in) of Alsace determines the precise aromas and flavors of each Alsace grape variety and so of the wine it will produce. 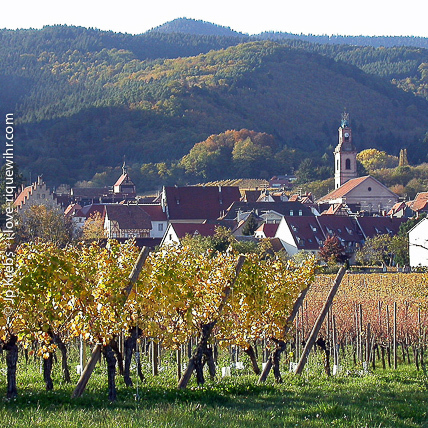 Situated on the Schoenenbourg hill in Riquewihr, facing South, these vineyards take maximum advantage of their exposure to the sun, particularly as the vines are trained along high wires. 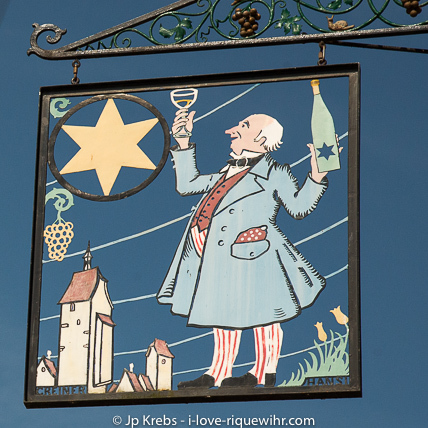 The Lonely Planet tourist guide recommends the Fêtes du Vin (wine festivals) taking place in villages all over Alsace during the summer,and the Winstubs (literally “wine rooms”, local wine bars also serving food) offering local gastronomic specialities. From April to October, a succession of wine festivals and wine fairs will highlight your trip. In August there is the traditional Colmar wine festival, Foire aux Vins d'Alsace: usually more than 10 days of celebrations for what became the major summertime event in Alsace (more than 250 000 visitors every year!). While staying with us in Riquewihr, we will inform you about the major events occuring during your stay. For more events and places to visit in Alsace and nearby Germany and Switzerland, read and follow our blog. Riquewihr in Alsace, a pearl on the wine route. The Alsace region is located in the North East corner of France. Situated on the Vosgian foothills, at an altitude of 200 to 400m the vineyards take maximum advantage of their exposure to the sun, particularly as the vines are trained along high wires. The Alsace Wine Route has become famous the world over for its exceptional natural beauty, its simple course and for the instant connection its visitors feel with the region and its growers. The Alsace Wine Route winds its way from north to south, for more than 170 kilometres (106 miles) along the eastern foothills of the Vosges. 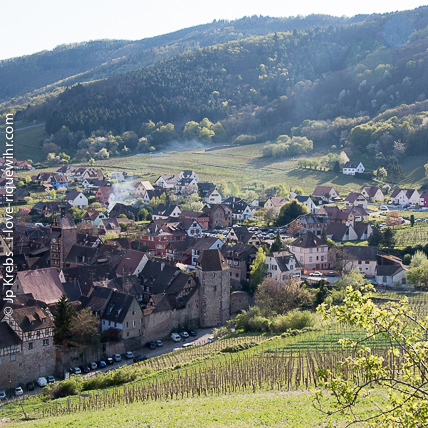 Riquewihr is in the very heart of the Alsace vineyards, a major milestone on the Alsace wine route. Larger groups: If you are looking for good winemakers to have a unique Alsace wine tasting with your larger group or private party, do not hesitate to contact us. We will put you in touch with some excellent winemakers so that your wine tasting in Alsace will be an unforgettable experience. You will taste some of the best wines of Alsace, learn a bit more about how to enjoy fully the wine and also how to match wine and food. Click here to contact us and send us your requests, needs or ideas. 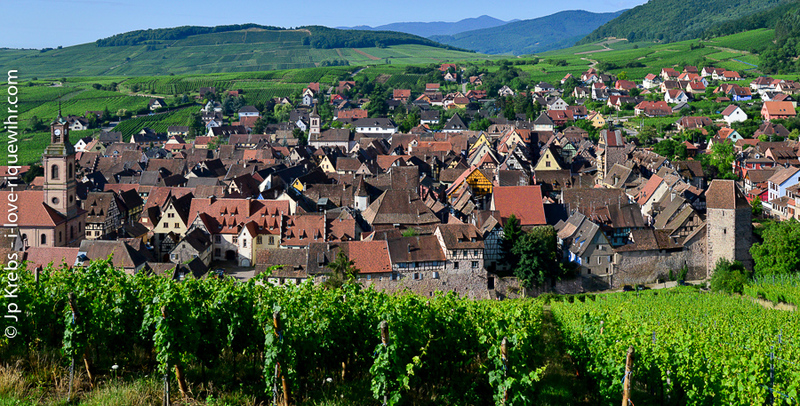 Riquewihr on the Alsace wine route is located at the foot of the Vosges Mountain. The Alsace region has an area of 8280 square kilometers. The region, famous for its production of aromatic white wines, boasts 4,930 small vineyards covering 15,535ha! 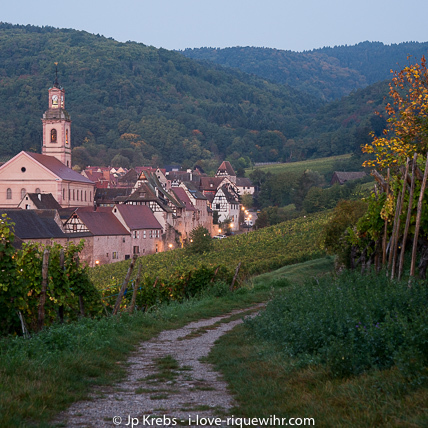 Sheltered from oceanic influences by the Vosges mountains, Alsace enjoys some of the lowest rainfall in France (just 400-500mm or 16-20 inches per year) and Riquewihr is right in the middle of the driest area. It is blessed with a semi-continental climate - sunny, warm and dry, which while offering a fantastic advantage to tourists, also provides the perfect conditions for winemaking as it encourages the slow, extended ripening of the grapes, resulting in elegant, complex aromas and flavors. 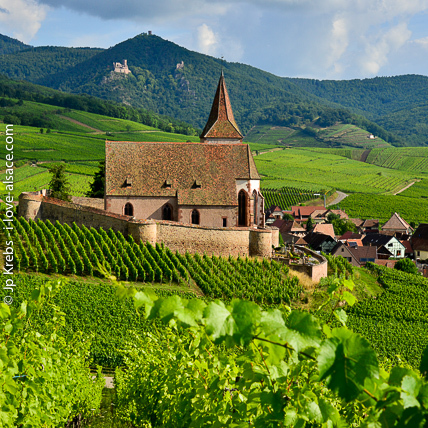 Alsace enjoys some of the lowest rainfall in France and Riquewihr is right in the middle of the driest area. Therefore the wines produced in Riquewihr count among the best in Alsace. 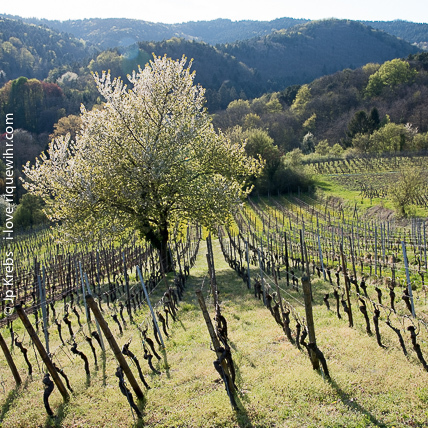 The best vineyards of Alsace are located on hills carrying a Grand Cru appellation. Riquewihr has 2 grands crus: Sporen and Schoenenbourg. Riquewihr wine is famous since the Middle Ages. 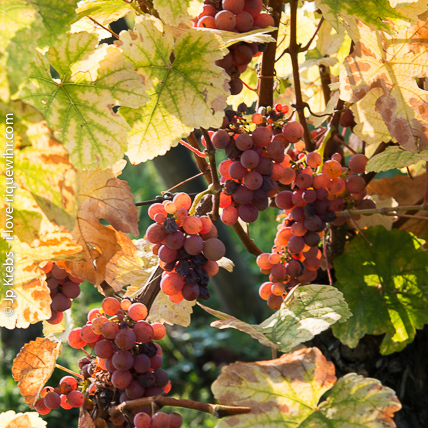 Alsace famous grape varieties are Riesling, Pinot Gris (called Tokay in the past), Muscat, Gewurztraminer. All these varieties are grown in Riquewihr. You will find these wines on the labels of the bottles. There are also some other, usually cheaper, varieties like Sylvaner, Auxerrois and Pinot Blanc (all white wines). Edelzwicker is not a grape variety but a blend of several noble varieties like Riesling, Pinot Gris, Muscat or Gewurztraminer. Each winegrower has its own recipe which may change from year to year according to the production of the moment. Also more and more excellent Pinot Noir red wines are produced in Alsace. Klevner - actually the Alsatian name for Savagnin rose - is growing more north, not in Riquewihr. An Alsace wine can match every occasion. Delicious as a drink before the meal, the wines made in Alsace are also perfect partners for fish and seafood (this is the reason why so many Alsatian villages have a partnership with villages in Brittany, on the West coast of France!). But Alsace wines are also matching poultry, white meat, game, the famous duck or goose 'foie gras', exotic recipes (thai, indian, chinese or creole cooking deserve a Gewurztraminer! ), dessert and what could be a surprise for many: cheese! Contrary to popular belief, in most cases white wines are better adapted to cheese than red wines. This is particularly true with strong cheeses like Munster or Roquefort and all the blue cheeses. Alsace wines make ideal partners for all the produce of the sea. Sylvaner with shellfish, Riesling with salmon, or Gewurztraminer with Chinese-style shrimps, these are just a few examples of the numerous matchings of Alsace wines and fish recipes. White meats naturally call for white wines often better than red wines. Serve a Riesling with your roast chicken, Pinot Gris with roast veal. Choose a Gewurztraminer for pork with pineapple... 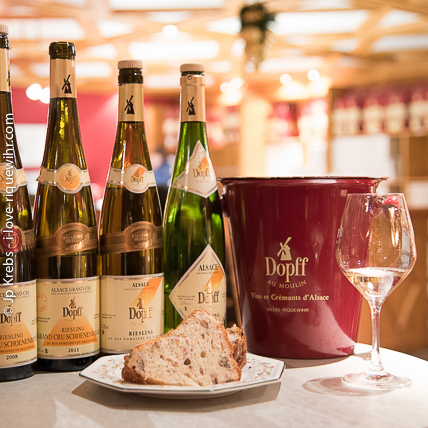 Many rich combinations are possible between Alsace wines and white meats. 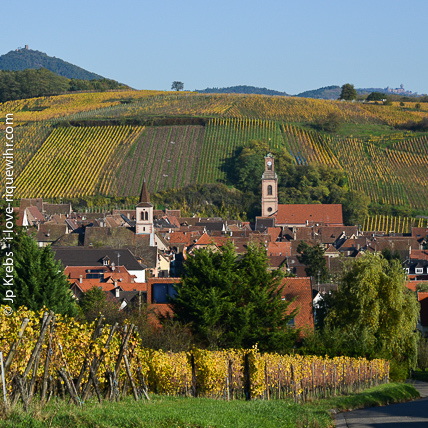 Alsace wines love to explore exotic new territory. For Alsace wines, gastronomy knows no frontiers : thanks to the distinct personality of each Alsace wine, they match all types of recipes, from Asian to Mediterranean, from Indian to Mexican. Sylvaner and sushi, Riesling and Chinese fondue, Gewurztraminer and tacos, these are the first steps along a gastronomic tour of the world. Contrary to popular belief, in most cases white wines are better adapted to cheese than red wines ; Alsace wines are particularly well suited to accompany all types of cheese : from soft and mild cheeses (serve Sylvaner or Pinot Blanc), to goat cheese (perfect with a Riesling), to strong cheeses (Gewurztraminer), to hard cheeses like Cheddar (Pinot Gris). Try them, you will be captivated ! 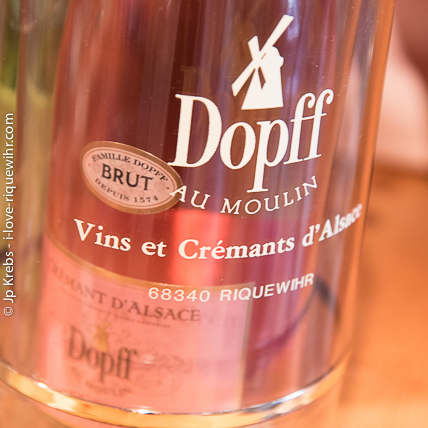 Alsace is best known for its dry wines, but it also produces more and more powerful and even sometimes sweet wines, like Gewurztraminer that goes wonderfully with slightly sweet desserts, as does Crémant d'Alsace. With sweeter desserts, nothing can be better than a late-harvest 'Vendanges Tardives' or 'Sélection de Grains Nobles' wine. Both types of wine, rare, sweet or liqueur-like, will give a special cachet to all fine desserts. Crémant is the local Alsace sparkling wine. It will match any meal or recipe. This special wine seminar at our premises is for you! The origin of the wealth of Riquewihr, its beauty and everything that you will enjoy in this village comes from its extraordinary wine. 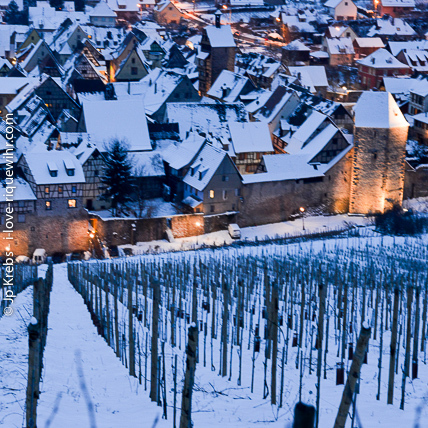 For centuries, the vineyards of Riquewihr have produced some of the most beautiful wines of Alsace and the world! Regularly our guests staying in our holiday apartments in the historical village of Riquewihr were insisting in having the opportunity to get deeper in the world of our local wines. With this new private (10 people maximum) wine seminar in English open to every wine lover we are fulfilling their wishes! Learn how to taste and serve wines like a pro! Wine service and wine tasting explained under the guidance of a professional sommelier. Take your new skills back home and use them with any wines. 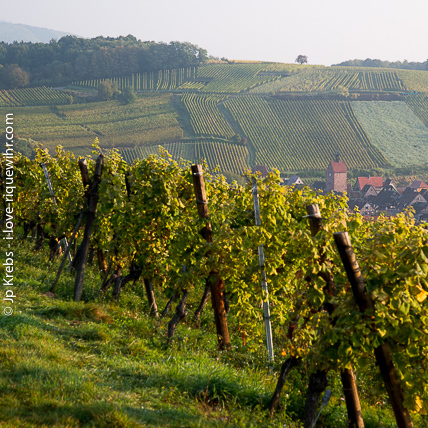 Discover the wines of Alsace, Riquewihr and their history. Taste 9 great wines of Riquewihr, including some Grands Crus. Wines and gastronomy: how to pair wine with food? The wine tasting comes with a lunch of refined morsels carefully paired with each wine. Duration 2:30 hours. In English. Learn more, see the dates, book online. Grape harvesting is also a matter of organization. It is necessary to make the most out of the weather conditions in order to bring the best grapes possible to the cellar. 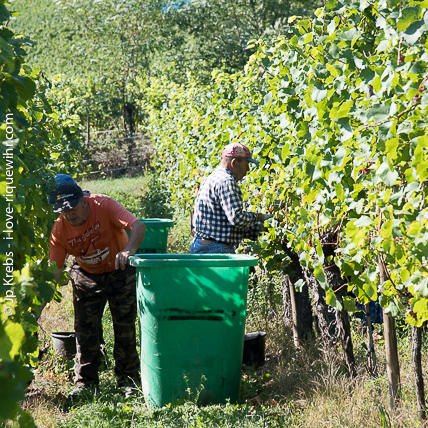 September (sometimes as early as end of August) and October are the time for grape harvesting. Then there is a very special atmosphere in the village. The winegrowers and their people are busy with taking in the grapes. And end of September it is possible to taste the new wine. Actually it is a kind of sweet grape juice. The sugar of the grapes did not yet turn into alcohol completely. A nice aperitive with wallnuts which can only be tasted locally since the new wine cannot be bottled. Grapes waiting to be taken in. In Winter, the winemaker has got more time for you to let you taste the wonderful wines of his cellar and introduce you to the mysteries of the wine from Alsace. The restaurants, inns and taverns that are open in winter are those frequented by Alsatians themselves, a guarantee of quality and authenticity. In winter, the treasures of medieval architecture, the picturesque streets of Riquewihr, the crown jewels of the museums in Colmar belong to those who know how to choose a different approach for their stay in Alsace. Winter is the quietest period for the visit... Time for connoisseurs! In Winter the winemaker is busy in his cellar and will have more time to let you taste his wines. 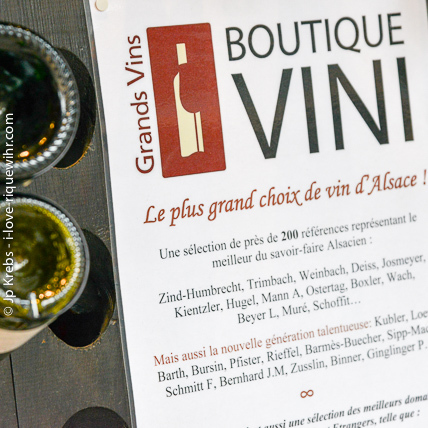 A lot of small wineries are producing great Alsace wines! Summer in the vineyards. The neighbour village of Hunawihr and its medieval church surrounded by the vineyards. On the winepaths everything is explained about growing the wine. Our Old Winery property: around a garden, 6 outstanding vacation rental apartments newly rebuilt in a former historical winery facing the most famous vineyard in Riquewihr.